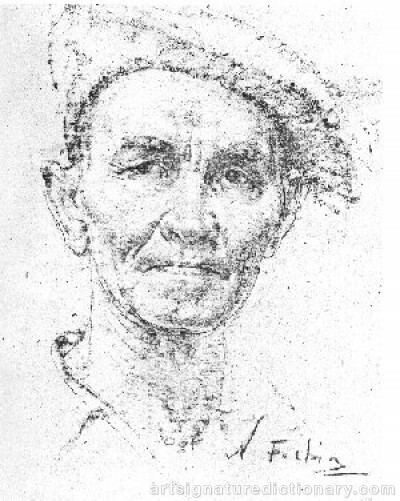 Nicolai Fechin was born in 1881 in the city of Kazan, Russia, the son of Ivan Alexandrovitch Fechin, an accomplished icon maker, woodcarver, and gilder. At the age of thirteen Fechin was ready to begin his life's work, attending the Kazan School of Art (1895-1901) and then the St. Petersburg Imperial Academy of Arts, where he was taught by the great Russian master, Ilya Repin. His work appeared in America for the first time at the 1910 International Exhibit of the Carnegie Institute in Pittsburgh. In both western Europe and America, Fechin was greeted with instant acclaim. Among such distinguished contemporaries as Claude Monet, Pisarro, Gaston Latouche, Sisley and John Sargent, he won his first prizes and medals. He was called a "Moujik in art", the "Tartar painter." Hardships following the Bolshevik Revolution eventually led Fechin to take his wife Alexandra and daughter Eya to the United States in 1923. The family first settled in New York but not for long. Since a child, he had loved the somber forests and peoples near the Tartar border in his homeland. He found their equal in the high pine forests of the Colorado Plateau, the old adobe villages, and the Pueblo, Apache and Navajo tribes of the American Southwest. In 1926 he moved his family to Taos, where a small community of artists also made their home. He purchased a house in the middle of seven acres adjoining the Indian reservation. His father's influence took over as Fechin spent the next several years handcrafting every viga, corbel, lintel and swinging door and niche for icons. Today the home itself remains a work of architectural art and is the base for the Taos Art Museum - a non-profit cultural organization formed in 1981 to celebrate the life and creative pursuits of Nicolai Fechin and to host exhibits, concerts and make available information about this artist. For seven years, before finally settling in Santa Monica, Fechin took great delight in the abundance of subject matter the Taos area provided him. He worked with vibrant hues to paint the native people and traveled south to Mexico to sketch in charcoal, pencil and pastel the many faces of its people. The sketches reveal the superb draftsmanship underlying all his work. Author Frank Waters once wrote of Fechin,s paintings, "How they shout and sing! No man has this intensity of color. Few can equal his masterful draftsmanship. 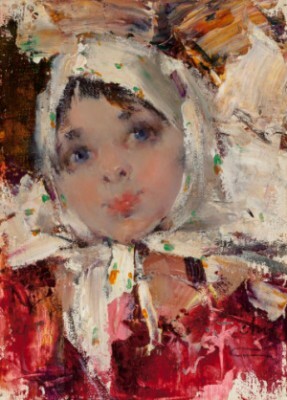 Whatever his subject, Fechin's work is stamped with his immediately recognizable style.